Last week, we explored ways to accomplish elevation changes to add visual interest to a flat garden. When we begin with a very different topography, one with significant ups and downs, a surplus of visual interest could challenge the gardener. A gentle slope could present minimal problems. It could in fact enhance drainage and sight lines, so that the viewer could see more of the landscape at once. A property that slopes away from the residence would be preferred, however, to one that slopes toward the residence and could directs rainwater to places where is unwanted. A significantly sloping garden site could raise problems in two areas: navigation and water erosion. Both problems could be addressed with a single strategy, in some cases, but we will first consider them separately. Water erosion in a garden will lead eventually to the loss of plants, topsoil and desirable organic material, so it must be controlled. There are two strategies for controlling erosion in landscaping: slowing the flow of water to promote percolation and growing plants to hold the soil in place (and also to help slow the flow of water). The primary method for slowing the flow of water is to install baffles. For a gentle slope, baffles could be landscape timbers or stones. 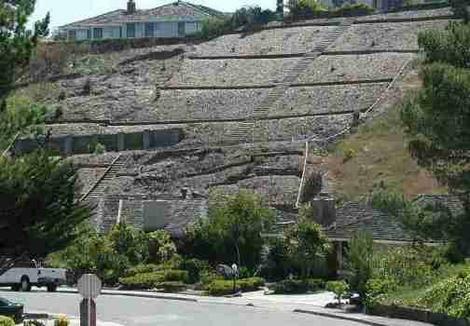 Steeper slopes could require a series of terraces. Terraces could be created by digging steps into the slope, and reinforcing the risers with wood, stone, bricks or concrete. The materials could be more or less natural in appearance: for example, a wooden reinforcement could be logs or milled lumber, a concrete wall could be poured in place or made with concrete blocks. Terraces, like steps, have treads and risers, but these elements can differ greatly in their dimensions. For steps, treads should be no less than eleven inches, and risers should be no greater than six inches. For terraces, however, treads should be much deeper, enough for both a planting bed and an access path for maintenance. Terrace risers can be of any height needed to control erosion. Note that a permit could be required for a riser high enough that the local building code defines as a wall (four feet, often). Terraces could slow the flow of water without vegetation, but they would be more effective when the addition of plants. For a moderately steep slope, a combination of terraces and steps could be a substantial challenge for both engineering and garden design. This example shows the combination of terraces and steps. Notice, also, that a grassed pathway provides access to the upper planting bed. Some slopes are simply too steep for terracing. In such situations, the slope should be planted to hold the soil in place. When starting with bare soil, as with new construction, temporary installation of landscape netting, coir logs or biodegradable wattles could help the plants to establish their roots. The next image illustrates the temporary use of biodegradable wattles to minimize water erosion while new plants establish their roots. It is not clear from this distant view if seeds or seedlings have yet been installed, but that action generally would follow the placement of wattles. Management of large, steep slopes like this one should include soil testing and engineering study to ensure that the planned actions will be effective and the slope will have been stabilized. 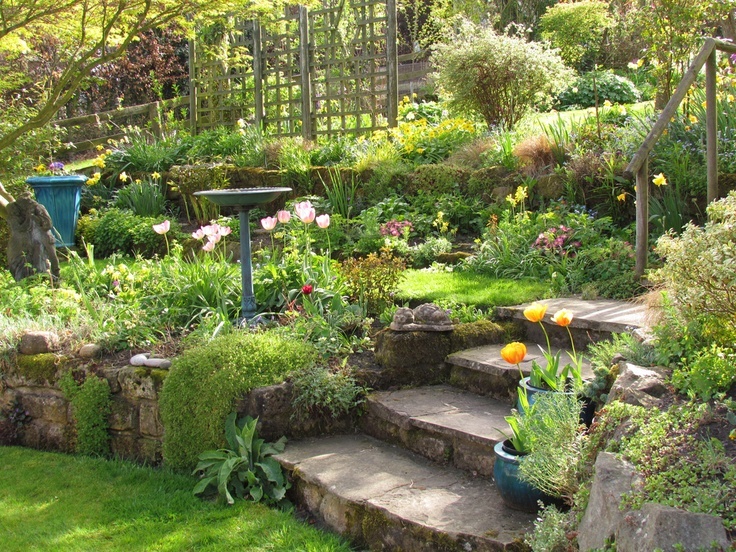 Gardening on a slope involves some challenges, but the end result can be elevating! This entry was posted in Spring Quarter and tagged landscaping, Renovation, Terraces by tomkarwin. Bookmark the permalink.